Weather is annoyingly fickle, and so is the wind. If massive offshore wind farms are going to become reality, we need better ways to store the extra energy from windy days for the windless ones. One a bizarre-sounding idea floating around: giant balloons of compressed air stored deep underwater. Like many good ideas, the seeds of compressed-air energy storage, or CAES, were sowed long ago, in the 1870s. Today, a handful of operations store energy as compressed air in sealed-off caves or pipe systems. But that's all on land. Bringing CAES deep underwater, where water pressure naturally keeps air compressed, is a novel and tantalizing idea for the massive offshore wind farms of the future. In August, IEEE Spectrum reports, the Toronto-based Hydrostor will make the first commercial deployment of underwater CAES technology. It'll use electricity to fill several balloon-like bags tethered to the bottom of Lake Ontario with compressed air. To turn that stored air back into electricity, they'll run the compressed air through a turboexpander. Proponents of CAES have their sights set on grand scales. 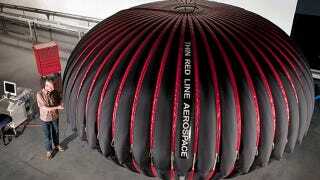 Maxim de Jong, CEO of Thin Red Line Aerospace—a company that also makes the energy bags—recently calculated how underwater CAES would be used to store energy from the London Array, currently the largest offshore wind array in the world. One day's worth of energy from the array would require 812,000 cubic meters of compressed air, or a whopping 27,500 of his company's five-meter diameter balloons. If we made much bigger balloons, say 41 meters in diameter, de Jong calculates you'd only need 23 of them.